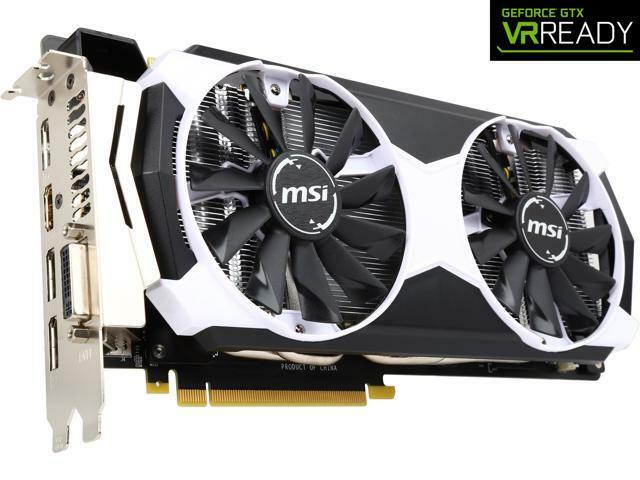 The MSI GTX 980Ti 6GD5T OC is the new flagship graphics card engineered and optimized for 4K gaming. It's based on the state-of-the-art new generation NVIDIA Maxwell architecture, and features 2816 CUDA Cores and gigantic 6GB, 384-bit GDDR5 memory. It delivers unrivalled graphics performance to take on virtual reality (VR) and 4K gaming at high settings, while also being acoustic-, thermal- and power-efficient for an evolved gaming experience like never before. Highest-grade components and meticulous craftsmanship ensure unbeatable stability and reliability even in the heat of gaming. Performance is just part of the story. The new Maxwell architecture is engineered with the new VXGI (Voxel Global Illumination) technology to solve some of the most complex lighting and graphics challenges in visual computing. Scenes are significantly more lifelike as light interacts more realistically in the game environment. Super Resolution technology lets you enjoy the detail and brilliance of 4K gaming even on 1080p displays. The G-Sync technology ensures smooth, tear-free images by synchronizing display frame rate to GPU (require displays that support G-Sync). An array of NVIDIA GTX technologies are also built in, like GPU Boost, NVIDIA 3D Vision, NVIDIA Surround, NVIDIA PhysX, and GeForce Experience. These technologies together provide the most immersive and competitive gaming experience possible. This MSI card is overclocked to 1102/1190MHz Base/Boost Clock (1000/1075MHz for the reference card), and boasts Military Class 4 Components for unbeatable durability and reliability. An evolved cooling solution featuring two large fans enables efficient and quiet cooling even at high loading level. Superb Cooling The Armor 2X thermal design incorporates two large fans and huge heat sink for better heat dissipation, while the Propeller Blade technology produces 20% more airflow and less noise than traditional fan design. Airflow Control technology deflects more airflow to heatpipes and improves airflow efficiency, which achieves the effect of increasing the heatsink area to enhance dissipation efficiency. Military Class 4 Components Certified to MIL-STD-810G standards, this card is built with Hi-c CAP, Solid CAP, and New SFC components for top stability, durability and quality you can count on in the harshest gaming environments. Multi-Frame sampled Anti-Aliasing (MFAA) With the launch of Maxwell the Multi-Frame Anti-Aliasing (MFAA) is introduced to the world. This new, Maxwell-exclusive anti-aliasing technique improves edge quality with a minimal performance cost, and helps you enjoy anti-aliased games at ultra high resolutions like 4K. Dynamic Super Resolution (DSR) Dynamic Super Resolution renders a game at a higher, more detailed resolution and intelligently shrinks the result back down to the resolution of your monitor, giving you 4K-quality graphics on an HD screen. Voxel Global Illumination (VXGI) Voxel Global Illumination (VXGI) is a stunning advancement, delivering incredibly realistic lighting, shading and reflections to next-generation games and game engines. NVIDIA G-SYNC NVIDIA G-SYNC is a groundbreaking new display technology that delivers the smoothest and fastest gaming experience ever. G-SYNC's revolutionary performance is achieved by synchronizing display refresh rates to the GPU in your GeForce GTX-powered PC, eliminating screen tearing and minimizing display stutter and input lag. The result: scenes appear instantly, objects look sharper, and gameplay is super smooth, giving you a stunning visual experience and a serious competitive edge. Other Thoughts: I would always recommend MSI GPUs and MBs. Yet to let me down. Thank you for sharing your experience with the MSI product! Glad to hear you are still enjoying your card! We certainly appreciate your patronage over the years! If you ever require technical assistance, please feel free to contact our technical support department directly at 626.271.1004 from M to F, 9am to 6pm Pacific Standard Time. Pros: Fans aren't too loud. Made out of durable material. Cons: Runs REALLY hot, under full load with fans at 100% and not overclocked the temperatures reach 91C, doesn't look like the card will last long. Doesn't have a back plate. Other Thoughts: I wouldn't recommend this particular model from MSI, if you are a buyer look for other models like the gaming 6g one. Thank your for sharing you experience with us. We always value your feedback, and I'd like to apologize for your unfortunate experience with the GPU. This model by default does not come with a backplate. A backplate does not necessarily improve GPU cooling; temperatures are mostly dependent on the GPU's heatpipes in conjunction with its fans. Does your setup have the proper amount of ventilation required to help move and exhaust air out of the case? I would recommend checking your case to see if the fans are balanced and/or are inducing unwanted anomalies that do not properly cool the card. Additionally, I'd highly advise you to call our tech support department, as they are much more qualified to provide you with answers that will help you maximize the cooling on the 980 Ti. You can reach them through phone or email. I want a second one! Cons: This card loses performance in games that do not support DX11 or DX12. DX9 games are most notorious for the apparent lack of performance. Bare that in mind when you use this card. Note: This card doesn't overclock particularly well, but it will overclock. Other Thoughts: Now if you want to see what makes this card so Beast; Go play Star Citizen. Very High Detail: FPS does change and is noticeable. Other Advantages: I can now stream SC on twitch at 60FPS @1280x720 with near perfect fluidity; What you see on my twitch stream is how smooth the game feels to me. I am working on tweaking my broadcaster to stream 1920x1080 @ 60fps on twitch. It is possible with this card. Do not try to run Haeven Benchmarks; The score you will get is unrealistic because the software doesn't support Quad Core CPU's It only supports Dual Cores. Some software is designed to use a certain number of cores, the rest are just wasted on benchmark tests. Star Citizen for example will support Hexa Core: So SC is a good benchmark to make for the newer Haswell Cores. Update: 08/11/2016 - I recently upgraded the cooling solution for this card. This card doesn't break a sweat even when overclocked. And when I say it doesn't break a sweat I mean that literally. Liquid cooled with NZXT Kraken G10 + NZXT Kraken X31 Liquid cooler (Upgraded radiator fan to 117CFM fans - THIS MADE A HUGE temp difference) When I was running on air cooled 30-40 degrees C idle, and up to 80 degrees C overclocked. Only downside to the Kraken upgrade. It's a HUGE pain to install. If you plan to liquid cool 2 cards. Do them at the same time, not at different times. You'll understand why when you install the Kraken G10. I do have one question to Newegg: Why are you selling this card for $820? When I bought mine for $650, and people can get 1070's and 1080's for $400-$700 with 5-20% more performance? You are crazy if you buy this card from newegg for $800. It's a good card, but not worth $800 especially now that the 1070 and 1080's are out. Pros: This card is a beast! 2k 1440Hz ultra everything 60+ fps! Runs hot like a performance card should! Other Thoughts: If you have a well cooled rig this will run around 72° even though Nvidia approves it up to 105°. Pros: It's a 980 Ti... It's good. OC out of the box is nice. Cons: Runs a bit hot, like everyone else has mentioned. I found the best way to work around this is to use MSI Afterburner and set up custom fan speed curves. It's a bit loud when the fan is running at higher speeds, but if you have a headset/earbuds/surround speakers, it's not noticable at all. Other Thoughts: 9.5/10 would recommend. Oh, and I was upgrading my old 760, and I broke the PCIe 3.0 slot somehow, but I threw it into a PCIe 2.0 slot and it works just fine. If this happens to anyone else, don't worry, I did research and apparently it will only cut performance by a few percent, but that's even only for high end games and benchmark tests. Cons: Temps get to around 77C in benchmarks but, never go above 72C while gaming. Other Thoughts: Very large cooler, make sure your case has the clearance to fit the card. Pros: Excellent product from M.S.I ,The fans are super quite cant hear them even on full load gaming,runs everything buttery smooth,coming from 2 670's in sli this single card beats those hands down,noticed stuttering in tom clancy's the division then i popped this bad boy in and no hiccups at all,absolutely amazing card. Cons: none,runs great and is very quite cant hear it over my case fans! Other Thoughts: I was going to opt for an evga card but i seen the price of this and had to jump on it,paid less and have about the same core clock as the ftw,i would definitely recommend this for gamers. also the white goes great with my corsair air 540 snow edition!